When I asked Sali of Pink Manhattan to share the story of her personally created fragrances, she was more than happy to oblige ... and quickly! This multi-talented, generous and insightful lady has been so gracious in sharing some of her thoughts and secrets regarding her beautifully composed fragrances. Here are a few of them. What inspired you to create your own fragrances? Concept: I’m an independent singer-songwriter who wanted to combine music and scent together as part of one sensory experience. I named my CD Pink Manhattan, and so the matching fragrance shares its name. I call the work Pink Manhattan Sensorium of Song and Scent, Part I (CD) amd Part II (Perfume). That was my first perfume, and then Persephone followed just a couple of years later. Persephone will have a corresponding CD released in 2008. It was planned for 2007 but I’ve pushed it back till it’s really ready. We’re working on it, and when it launches, it should be slammin’, so stay tuned. Tell me the significance of the names "Pink Manhattan" and "Persephone"? I’m the nose behind both. I’m a grass roots perfumer who uses oils and mixes them in my home studio. I don’t work in a fancy high tech lab—I just use my nose and buy the best materials I can afford, then mix them till they live up to my personal standard of a well-blended piece of work. While I was finishing my Pink Manhattan CD, I was looking for a peach-gardenia-vanilla scent to wear (I usually wear perfume to feel inspired, or just to enjoy) and found none that perfectly suited my craving, so I decided to make my own. The theme fit the name Pink Manhattan exactly, so I went with it. I liked many fruity vanilla-based gardenias out there but wanted something a little more understated than what I found—something close to the smell and taste of gorgeous, huge, crisp and juicy white peaches I’ve experienced in Japan. Those of you who’ve visited Japan know that if anything is excellent in Japan, the quality of food is. Speaking of Japan, Pink Manhattan was first sold through a Tokyo radio station (J-Wave) that sold both CD and perfume to my American Top 40 listeners overseas! 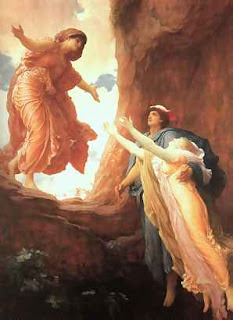 Persephone was first created as part of a collection of goddess-inspired perfumes for a friend with a New Age business. The business has been on hold, so I rescued Persephone, the favorite blend of just about everyone in my life, and decided to recreate it using the very best materials I could afford before releasing it under my own brand. The result is a sumptuous, hedonistic Gourmand-Oriental, just the way I’d envisioned it: a ravishing jewel of a blend for evening, a modern take on the classical Oriental. It also follows Pink Manhattan logically because it’s a similar composition built with lower notes, maybe an octave or two down. Here, too, I wanted to create something I didn’t find out there, which was a chocolate-berry-amber. I think Bath & Body works and others have all taken up on this idea by now, but only mine contains no patchouli nor orange, and instead includes magnolia, hyacinth and other regal florals to round out the elegant composition. Why is it sometimes referred to as Unreleased Mix a.k.a. Persephone? I had renamed it Unreleased Mix at one point because I thought my 2nd CD might be called that, but that idea’s been changed, so it’s now back to Persephone. Mixing took about a year for each perfume. I compare the art of mixing perfume to mixing music. Although I’m a composer-arranger and not an audio engineer, I believe what the engineer does--the balancing of levels of each track--is very similar to the art of actually hand-mixing a perfume composition. It’s one part conceptual and one part physical—you really only get to do it once and if you mess it up, you’re back to the drawing board. It’s a bit like cooking too, although I’m much better in the studio than in the kitchen. I learned a lot in the process, such as how accords are born. It’s one thing to design a scent in your head but another to actually mix the notes and smell the result. Combining more than two notes was a huge challenge and took me hundreds of tries to perfect. In the end, I believe my perfumes came out as close to my original inspiration as possible. I invested in countless oils from many sources, but finally came across a handful I knew I could use. Finding the right materials took about 8 months for Pink Manhattan; then for Persephone, about a year. The biggest challenge for Persephone has been continuing to find the top grade Mysore sandalwood which has become extremely rare. As it stands now, I had just enough to finish the mixes I’ve made, and I don’t think I can make anymore that would smell like this, which is part of the reason I’m discontinuing the online sale of Persephone. I’m selling some and keeping the rest as my private blend until I can find a new resource for the sandalwood. Some of the “real” Mysore sandalwood I’ve bought in recent months have been of poor quality and I just wouldn’t use it, nor would I replace it with cheap synthetic sandalwood because I never liked that smell. I’m thinking perhaps it’s best to move on from using Mysore sandalwood since the trees are becoming extinct. My favorite sandalwood sold out at one source that still talks about that yield of oil, reminiscing about how amazing it really was. I can vouch for the quality because it’s what inspired me to create Persephone. What is your favorite aspect of the art of perfumery? As with music, I like the creation of the concept best of all. The initial inspiration is what propels the project forward. It’s the song I hear in my head, pretty much done. I might add lyrics later, but the song sounds the way it goes. I have to love the idea first—then, I can work at making that dream a reality. That part is also fun but harder work. Seeing the end result is a great reward, but I’m a perfectionist and tend to pick everything apart and think they could be even better. However, I think my perfume blends are as close to perfection as they could be at this stage, and I am proud to present them to the public. Tell me a little known fact about you? I used to host a weekly Japanese TV show called “New Yorkers” that was watched by millions. However, it was a satellite show, and not everyone had access to it. It was one of the first HDTV shows made by NHK. I sang the opening and ending theme songs, and actually wrote the ending theme song which is on my Pink Manhattan CD. I’ve also had a couple of radio shows, and here’s the weirdest job I’ve had in show biz: I do voice-overs for educational tapes. For these, I’m often asked to put on various degrees of a Japanese accent which I don’t normally have. LOL. It’s a blast and I love working with the people I work for. Her scents Persephone and Pink Manhattan are not only original and unique, but also very beautiful. Persephone combines dark chocolate, ripe blackberry, juicy pomegranite, earthy Mysore sandalwood and royal purple flowers to create an unforgettable gourmand fragrance that delights the nose with its sweet and delicious bouquet. As Sali mentions, Pink Manhattan is a delectable peach and gardenia blend featuring the most authentic and original peach accord I have ever encountered. The addition of pink hibiscus, French vanilla and sensual skin musk give it just enough intrigue and balance. Both fragrances stay close to the skin and would make a beautiful addition to any fragrance collection. Many thanks to Sali for her generosity with her time, energy and perspectives! For a limited time, Sali is generously offering a 10% discount and free shipping until 2/14/08 on any orders of Persephone for "For The Love of Perfume" readers only. To order go to www.salioguri.com or follow this link and include the code LOVEPERFUME for your discount. Image sources: "The Return of Perspehone" courtesy of matrifocus.com. 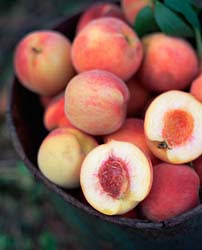 White peaches courtesy of jupiterimages.com.